When you are cooking healthy meals at home, finding ways to keep yourself satisfied is essential for reducing cravings and staying on track with your diet. For me, meals that are loaded with great flavor and texture do the trick and keep me out of a food rut. 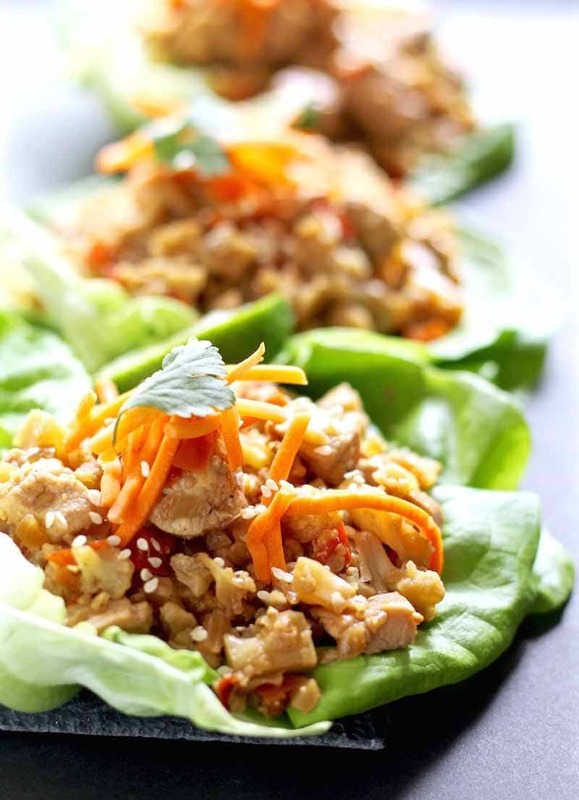 Healthy Chicken Lettuce Wraps will REALLY hit the spot if I am getting tired of the same-old, same-old dinners. The inspiration for this dish came from the Fried Cauliflower Rice & Shrimp recipe that we posted a few weeks back. I loved it so much that I wanted to find other ways to enjoy this recipe, so I added some lean chicken breasts to the mix and made them into low-carb healthy chicken lettuce wraps that can easily pass for a scrumptious taco. The second time I made these healthy chicken lettuce wraps, I added a fried egg on top of each wrap. If you like a nice runny egg, the yolk will act as an extra sauce to top off that tasty taco lettuce wrap. The egg also adds even more healthy protein and fat. Win-Win! The most wonderful thing about this dish is that it tastes SO GOOD (maybe even better) the next day straight from the fridge. You can make this meal for two for dinner, and still have plenty of leftovers for lunch the next day. Just remember to pack the lettuce and the stir-fry separately so the lettuce doesn’t get soggy. Serve hot or cold for a quick and easy lunch! I personally prefer my cauliflower chopped into ½-inch to 1-inch pieces for this recipe because I like the added texture. Chopping by hand will help you get that perfectly sized dice. Using a grater or a food processor will result in tiny chunks and your stir-fry will be a little bit softer in texture. If you love healthy tacos, take a look at our Vegan Pinto Bean Tacos as well. They are even easier to make and taste AMAZING! You can also take a look at this roundup of my favorite healthy diabetic chicken recipes. I always keep it updated with my new favorite recipes so it’s a great post to bookmark! 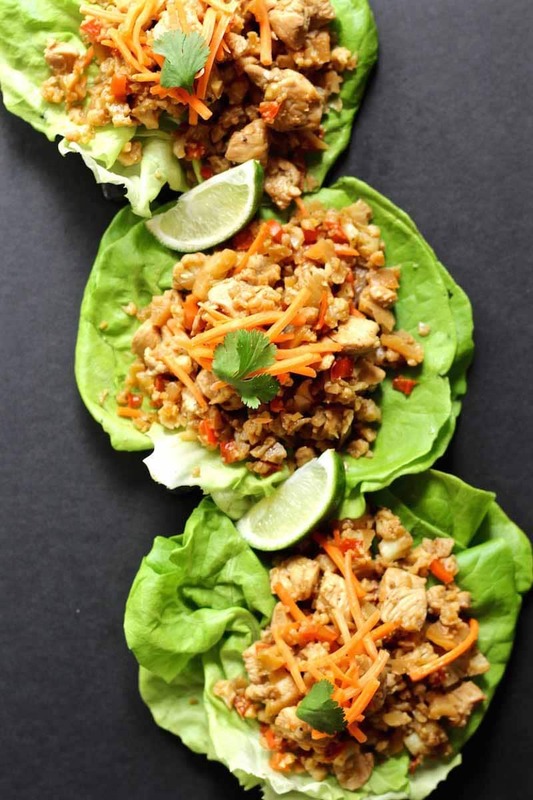 When you’ve tried these healthy chicken lettuce wraps, please don’t forget to let me know how you liked them and rate the recipe! 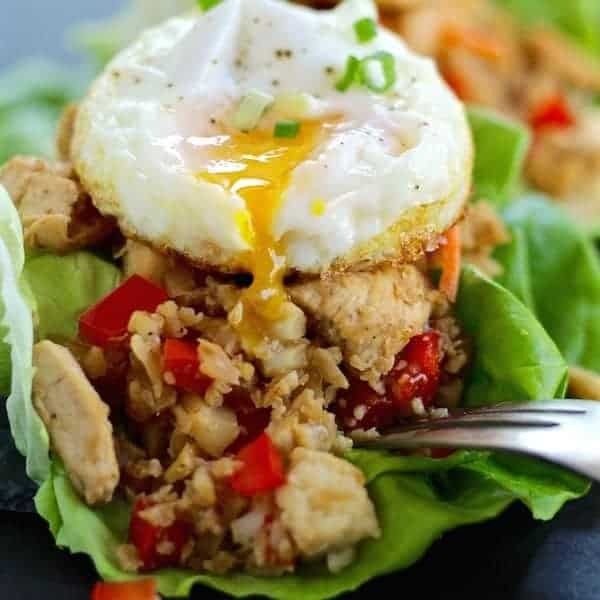 These delicious low-carb Healthy Chicken Lettuce Wraps really hit the spot when you want something light and healthy but filling. ¼ cup reduced sodium soy sauce, gluten free tamari or Aminos. Chop the cauliflower by hand into half-inch to 1-inch chunks. The food processor dices them too small, so by hand is the best way to chop them. Dice the bell pepper into small pieces. Place the bell pepper and cauliflower in a bowl and cover with 2 tsp. of olive oil. Season with a bit of salt and pepper. Coating them in a bowl prior to cooking helps to evenly coat the vegetables and reduces the amount of oil needed for stir-frying. Mince the garlic, ginger, and shallots and set aside. Remove the lettuce leaves from the head of lettuce and wash them. You will need two pieces of lettuce per taco for more stability (so you get eight tacos total). Heat a large sauté pan over medium high heat. Chop the chicken breasts into 1-inch chunks and season with a bit of salt and pepper. Coat the chicken breasts in 2 tsp. olive oil and sauté for about 5-7 minutes, or until they are cooked through, stirring occasionally. Remove the chicken and set aside in a clean bowl. Sauté the cauliflower and bell pepper mixture for about 5-7 minutes, stirring frequently. If the veggies dry out in the pan, pour a little bit of the chicken broth in once or twice to rehydrate them. Whatever broth remains will be used at the end. Add the shallot and sauté for about 30 seconds to 1 minute. Cover the veggies with a lid for about 1-2 minutes or until they are softened, but still have a bit of texture. Add the garlic and ginger and sauté for no more than 1 minute, stirring frequently. Add the soy sauce, the rest of the chicken broth, and the cooked chicken breasts, stirring constantly until the sauce is mostly absorbed into the vegetables, about two minutes. Top with a squeeze of lime. Place in a bowl and wipe out the sauté pan to use for the eggs. Add a touch of oil to the pan and spread it with a pastry brush or paper towel to keep the eggs from sticking. Fry up to four eggs at a time over medium heat, depending on how big your pan is. Cover the pan and cook the eggs sunny side up for about 3-4 minutes for a runny egg, or 5-7 minutes for a well-done egg. Season with pepper. Top the lettuce wraps with about ¾ cup of the stir fry mixture, some shredded carrots, sesame seeds, cilantro leaves, and top each one with an egg and a drizzle of hot sauce if you like it spicy. Enjoy! 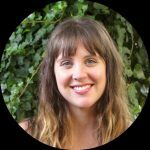 Leslie is the chief baking officer over at Bessie Bakes where she cooks and bakes up a storm with as many whole foods and organic ingredients as possible. She is obsessed with watching cooking shows, reading cookbooks, and spending all of her free time in the kitchen.